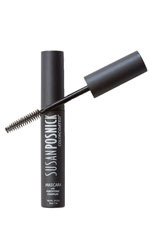 Accentuate your look with Susan Posnick for Eyes. Eye make-up with enhancing formulas that last all day without smudging, and can be layered for a more dramatic look. Intensify eyes with this dual ended eye pencil, with Jasper liner and Sandstone eyeshadow. Intensify eyes with this dual ended eye pencil, with Bronze liner and Copper eyeshadow. A water resistant lash enhancing black mascara with a conditioning complex to give you long voluminous lashes all day, through rain, sweat and tears. Intensify eyes with this dual ended eye pencil, with Platinum liner and Gold eyeshadow. Intensify eyes with this dual ended eye pencil, with Jet liner and Moonstone eyeshadow. Intensify eyes with this dual ended eye pencil, with Smokey Quartz liner and Rose Quartz eyeshadow. Intensify eyes with this dual ended eye pencil, with Amethyst liner and Opal eyeshadow. Intensify eyes with this dual ended eye pencil, with Sapphire liner and Ametrine eyeshadow. Intensify eyes with this dual ended eye pencil, with Turquoise liner and Topaz eyeshadow.